The format for this week’s comic was stolen from The Animaniacs. The story itself, however, is taken from real life. The true horror of that night is hard to relate in comic form. It was past three in the morning when the game ended, and if it went on any longer, I really believe blood would have been spilled. Actual real blood, and not figurative game blood. The problem here wasn’t type of game, it was simpler than that, coming down to nothing other than length of game. If you have a few drinks with friends over the course of one or two hours, you can play some fun games. But if everyone drinks over the course of four or more hours (truth be told we might have had one or two before then) then it can become a different experience all together. And yes, I know what many of you are thinking. Four hours for Game of Thrones? Firstly, it was only our second game of it, we didn’t know any better than to start that late in the evening. And secondly, as the game goes on, and certain players get slight inebriated, well, that doesn’t exactly speed the game up. So the game goes on a little longer, and so players have the opportunity of getting just that little bit drunker, and so on and so forth. It becomes a vicious cycle, the radius of which lengthens with each passing turn. Also I’m not actually sure I have ever played a game where the playing time was less than, or even equal to what the box stated. Board game boxes are, in my experience, wildly boastful and play fast and loose with their playing times. I still enjoyed the game, but the very end of that night’s gaming will live long in infamy. The player in question genuinely did not know he had won the game, and couldn’t be convinced of that fact, much to the ever-growing frustration of other players. Other very tired, and ever-more frustrated players. Voices were raised, threats were made, until I finally just picked up his pieces, made the move, so I could wake up Aileen and pack the game up. Awesome. I love the use of good idea bad idea from Animaniacs. Love the comics! Keep them coming! Thank you so much for your kind comments, we’re so glad you enjoyed the comics. 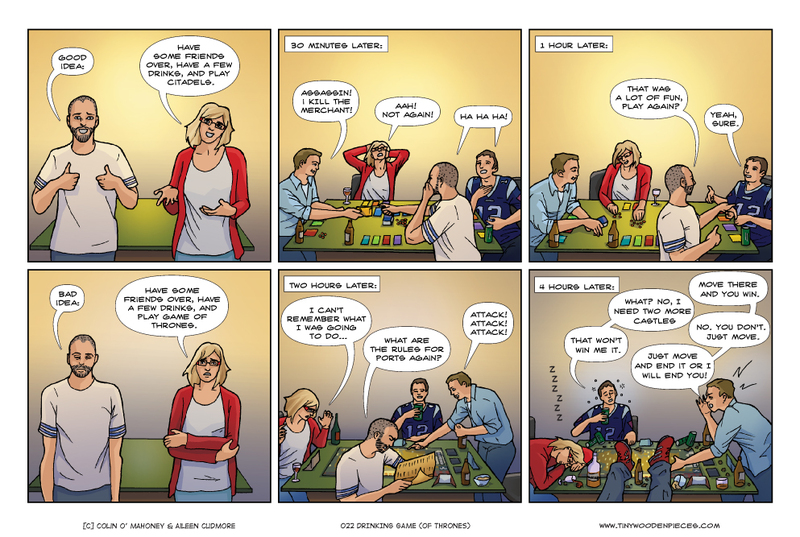 So long as we have plenty of games to play, we’ll keep on putting new comics up!